Hottest offer this summer, enjoy your holiday! Bring 5 friends to MULIARAPTURE at The Mulia Bali and your ticket is on us! BOOK BEFORE 31 JULY 2018. Paid by July 19th - 21st! & get additional bonus by mentioning BIMB. *terms and conditions apply. 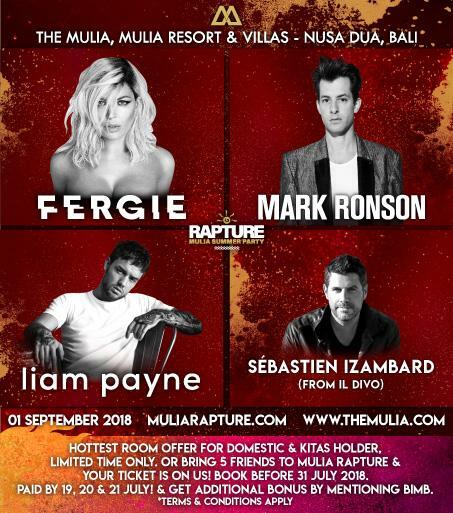 GET RAPTURED on 1 Sept 2018 at The Mulia Bali! Get your "beach glamour" ready for Bali's most enticing summer party by the Mulia Bali tropical pool and white-sand beach whilst enjoying a whole new level of entertainment from WORLD-RENOWNED SINGERS to Top International DJs! This year The Mulia proudly presents Fergie, Mark Ronson and Liam Payne along with extravagant entertainment and décor! Set along dramatically stunning coastline of Nusa Dua overlooking the shimmering Indian Ocean, the venue promises an astounding party. Stay at one of the best beachfront hotels in the world, avoid the hassle and enjoy RAPTURE - Mulia Summer Party to the fullest!